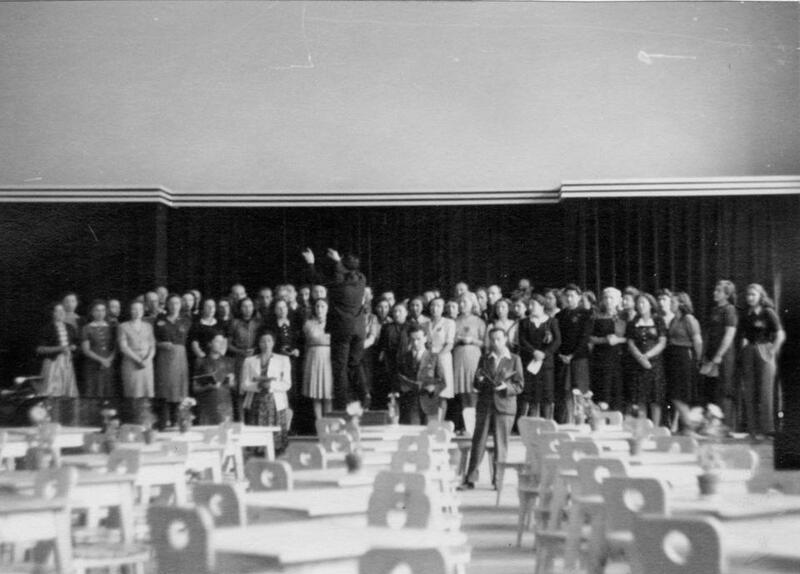 Prisoners of the Terezin concentration camp outside Prague rehearse Verdi’s Requiem for an upcoming performance for the Red Cross in the meeting room of the Terezin Town Council in 1943. POWER OF MUSIC: Author, poet, journalist, and filmmaker Susie Davidson of Brookline met Holocaust survivor Edgar Krasa of Newton when she was writing her first book, “I Refused to Die,” in 2002. Earlier this year, Davidson proposed they collaborate on a book focused on Krasa’s recollections of Rafael Schaechter, the composer, conductor, and pianist who staged musical productions with fellow inmates of the Terezin concentration camp outside of Prague. The 53-page book, “The Music Man of Terezin: The Story of Rafael Schaechter,” describes how the shows were intended by the Nazis to falsely convey how well the Jews were being treated. In fact, Krasa, who sang in Schaechter’s chorus, said the nightly practices following 10-hour work days provided the prisoners with life-sustaining memories of their former lives and hope for the future. For Krasa, the book is the culmination of his life’s mission to honor the “hero” who led 15 performances of Giuseppe Verdi’s “Messa da Requiem” — which the prisoners learned by rote in Latin — at Terezin in 1943. While the Nazis never interpreted the prisoners’ defiant lyrics warning of the coming wrath of judgment day, Schaechter was sent anyway to Auschwitz, where he died. “Although he did not survive, he became a member of our family,” Krasa said of the man after whom he named his son, Raphael. A frequent speaker at schools and civic organizations, Krasa is a board member of the Brookline-based Terezin Chamber Music Foundation, which has established the Krasa-Schaechter Commission Fund for young composers. Schaechter’s legacy is additionally honored by the Defiant Requiem Foundation of Washington, D.C., and the Beit Theresienstadt museum in Israel. “The Music Man of Terezin” is available for $8. For more information, visit susied.com. THANKING THE FACULTY: Longtime benefactors Jeff and Penny Vinik of Weston have donated $5 million to the Meadowbrook School of Weston to establish a new endowment through which holiday bonuses will be distributed to the 70 teachers and staff. It is the largest single gift in the school’s 84-year history. In honor of this most recent donation, the building that houses the gymnasium and arts department has been named the Vinik Family Center. Previously, the Viniks paid for the installation of a sidewalk, new parking lot lighting, and other facilities and classroom improvements. The Viniks’ four children graduated from Meadowbrook. Penny Vinik has served on the school’s board of trustees for more than 12 years, five of them as president. “This is our way to say thank you, now and in the years to come,” said Penny Vinik, who is also a trustee at the Museum of Fine Arts in Boston. “We know how hard this faculty works, day in and day out, for the benefit of its students,” added Jeff Vinik, founder and chairman of Vinik Asset Management, a minority owner of the Boston Red Sox, and owner and chairman of the Tampa Bay Lightning and the Arena Football League’s Tampa Bay Storm. The Meadowbrook School is an independent day school with more than 300 students in junior kindergarten through eighth grade. OUTSTANDING SERVICE: Anne Reenstierna has retired after 37 years at Brimmer and May School in Chestnut Hill, 27 of those as head of school. On July 1, longtime associate head of school Judy Guild of Carlisle moved into the head of school position. A resident of Newton, Reenstierna joined Brimmer and May as an English teacher in 1974. She was appointed head of the English department in 1975, and she was additionally the school counselor after receiving a master’s degree in psychology and counseling from Lesley College in 1979. Reenstierna became admissions director in 1980, and head of school in 1985. During her tenure, admissions at Brimmer and May more than tripled to its current 400 students, and the school increased its academic, athletic, and arts programs. Capital improvements have included the construction of the Chase Building Creative Arts and Science Center, Almy Academic Center, Corkin Visual Arts Center, and new fitness center, playing field, and field house. Guild came to Brimmer and May as an English and math teacher in 1984. She was assistant head from 1987 to 1991, when she left to pursue a master’s degree and care for her young children. She returned as assistant head in 1997, and was appointed associate head in 2002. THE SUN WILL COME OUT: Thirteen-year-old Lauren Weintraub of Sudbury beat out more than 400 girls for the lead role in the North Shore Music Theatre’s production of “Annie” from July 17 to 29. Among those playing Annie’s orphan friends are Elena Carmichael of Natick (as Molly) and Jessica Lewis of Needham (as Duffy). For ticket information, call 978-232-7200, go to nsmt.org, or visit the box office at 62 Dunham Road in Beverly. BLOOD AND FOOD DRIVE: The Sudbury Medical Reserve Corps is holding a blood and food drive Monday, 10 a.m. to 3 p.m., at Congregation B’nai Torah, 225 Boston Post Road in Sudbury. To make an appointment to donate blood, call 1-800-RED-CROSS (733-2767) or visit redcrossblood.org.